As candidates two years ago, the Republican governors of Kentucky and Arkansas swore they would do away with “Obamacare” if elected. But a funny thing happened between the campaign trail and the governor’s mansion: Reality set in. After promising to uproot Kentucky’s Medicaid expansion under the Affordable Care Act, Republican Gov. Matt Bevin simply renamed his Democratic predecessor’s health care plan for low-income adults and proposed changes designed to help people find jobs and get off the rolls. In Arkansas, Republican Gov. Asa Hutchinson changed the name of the Medicaid expansion program and proposed adding small premiums for people with incomes above the federal poverty line, $11,880 for an individual. As Congress prepares to repeal and replace the Affordable Care Act, 14 other states with GOP governors that opted to expand Medicaid under the law may face the same reality Bevin and Hutchinson did: Taking health insurance away from hundreds of thousands of people is a complicated and risky proposition. Medicaid spending for all states was about $532 billion in 2015, with about 63 percent funded by the federal government and the rest by states. In expanding Medicaid under the ACA, Republicans in expansion states chose economics over politics, even though it meant cooperating with a law that nearly all conservatives abhor. That calculus won’t change with the transition in Washington, according to Matt Salo, who heads the National Association of Medicaid Directors. “Not only do you have to consider the ramifications of denying health coverage to hundreds of thousands of constituents, but you have to face down insurance companies, hospitals and other titans of the health care industry, for whom this means disrupted business models and reduced revenue streams,” Salo said. Whatever their political affiliation, people will blame the incumbent governor if they or a loved one loses health care coverage, said Stephen Voss, a political scientist at the University of Kentucky. People will die and word will get out. In upcoming legislative sessions, many GOP-dominated states are likely to preserve expansion while adding so-called personal responsibility policies that have been proposed in Kentucky and adopted in Arkansas and five other states. Those policies include monthly premiums, copays and work requirements for low-income beneficiaries. Critics say such steps could erode enrollment. 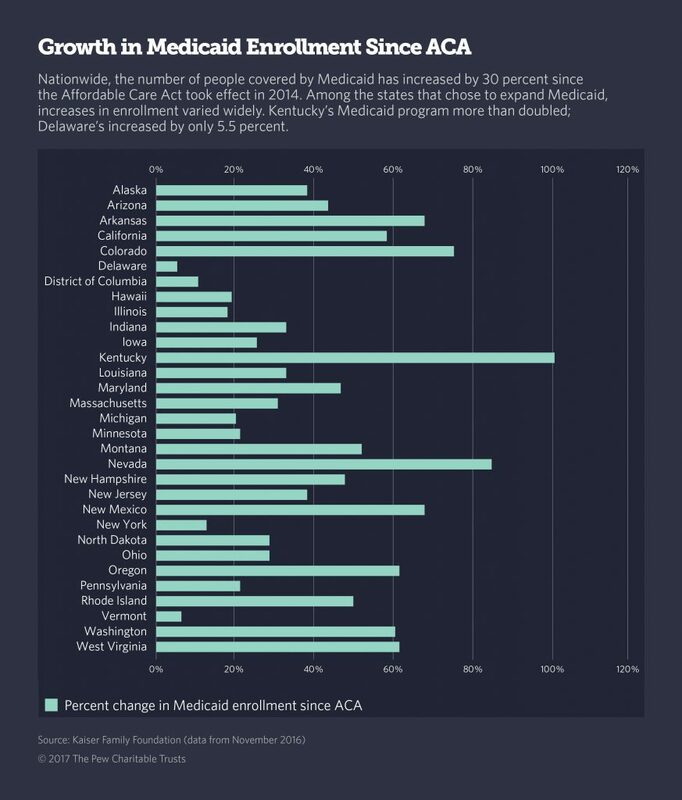 But Bevin and Hutchinson insist that if people are able to leave the Medicaid rolls because they become healthier and their incomes rise, everyone wins. “Instead of Medicaid as the be-all and end-all for who knows how long, it’s a transition to something better,” said Doug Hogan, a spokesman for Kentucky’s health and family services agency. Republicans in Congress want to replace many of the interconnected provisions of the federal health care law, including the so-called individual mandate requiring everyone to sign up for health coverage and the subsidized insurance marketplace where nearly 13 million people with incomes too high to qualify for Medicaid purchased coverage last year. But for states, repeal of the Medicaid expansion provisions would have the biggest effect on state budgets and the health and welfare of their residents, according to Jesse Cross-Call, a policy analyst with the Center on Budget and Policy Priorities, a liberal research group that collects and analyzes state health care data. President Donald Trump’s pick to lead the Department of Health and Human Services, Georgia Rep. Tom Price, has proposed an Affordable Care Act replacement that would do away with the Medicaid expansion. House Speaker Paul Ryan and other Republicans in Congress support dispersing federal Medicaid money through “block grants” to the states. Trump’s own health care reform agenda includes converting Medicaid to a block grant. Under a block grant, each state would get a fixed amount of money and would have broad discretion over how to spend it, instead of receiving a stream of federal dollars based on the actual costs of its health care program. Medicaid would cease to be an entitlement, in which everyone who qualifies is guaranteed coverage. Instead, the federal government and states could cap spending and restrict coverage, regardless of whether more people fell into qualifying income brackets during a recession, for example. In all, Medicaid covers about 73 million people. As a national average, the low-income health plan represents more than a quarter of state budgets. 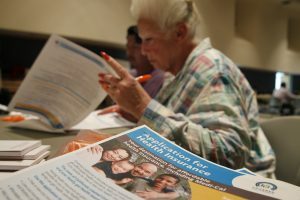 Under the 2010 ACA, which took effect in 2014, states can expand their low-income health plans to adults with incomes up to 138 percent of the federal poverty line ($16,394 for an individual), using primarily federal money. From 2014 through 2016, the federal government paid all of the costs to cover newly eligible adults in the states that accepted the option. Starting this year, the federal share dips to 95 percent of the roughly $53 billion annual price tag for the states that have expanded, and if the provision is left unchanged, the federal share would decline to 94 percent in 2018, 93 percent in 2019 and 90 percent in 2020 and beyond. 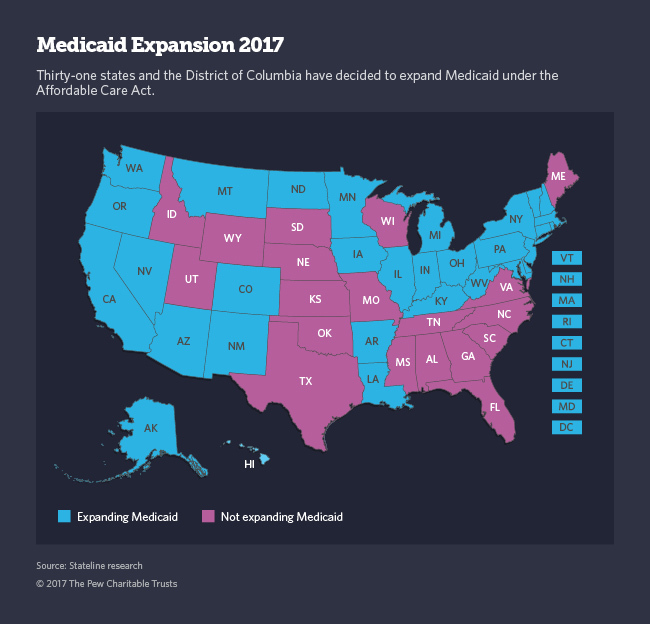 So far, more than 11 million adults have enrolled in expanded Medicaid programs in the 31 states and the District of Columbia where the option was adopted. Of those, 4.5 million live in states with Republican governors. No new states are expected to sign up for Medicaid expansion this year — at least not until the administration announces its replacement plan. North Carolina’s newly elected Democratic Gov. Roy Cooper earlier this month asked the federal government to approve his Medicaid expansion plan in the waning days of the Obama administration. But the state’s Republican-led Legislature secured a federal court order barring the administration from considering his request. Congress and the Trump administration could repeal major portions of the Affordable Care Act, but keep the Medicaid expansion provisions. In that case, the new administration could give states broader leeway to shape their expansion programs than the Obama administration has, said Robin Rudowitz, associate director with the Kaiser Family Foundation, which tracks Medicaid policy. “On certain issues, the Obama administration drew a line in the sand,” Rudowitz said. For example, it opposed state requests to limit enrollment to adults at or below the federal poverty level. Under the Obama administration, Arkansas, Indiana, Iowa, Michigan, Montana and New Hampshire received federal approval to expand their low-income health care programs for adults under different rules than traditional Medicaid. Arkansas, with its so-called private option, was the first state to receive federal approval for an alternative expansion plan in 2013. Instead of enrolling newly eligible adults in its traditional Medicaid plan, which serves primarily children, pregnant women and the elderly and disabled, the plan for low-income adults substituted private insurance for traditional Medicaid. A bipartisan collaboration between former Democratic Gov. Mike Beebe and the state’s Republican-dominated Legislature, the plan has managed to come in under budgeted costs while covering far more people than originally projected, said Amy Webb, a spokeswoman for the state’s human services agency. After it was approved, Iowa and New Hampshire proposed similar plans. Hutchinson proposed further modifications to the plan last year and dubbed it Arkansas Works. As of this month, it now includes small premiums for people with incomes above the federal poverty level and a requirement that those who work must accept employer-sponsored insurance, with Medicaid paying the employee portion of the bill. If the Medicaid expansion remains intact, Kentucky could be the first state to get approval for an alternative plan under the Trump administration. With enough latitude, even holdouts such as Florida, Texas and Virginia might be persuaded to accept federal money to cover low-income adults. This story was produced by Stateline, an initiative of The Pew Charitable Trusts. You can read the original story here.